Visual Productions has announced the new Distribution partnership with Advance Communication Equipment (ACE) for the Chinese market. 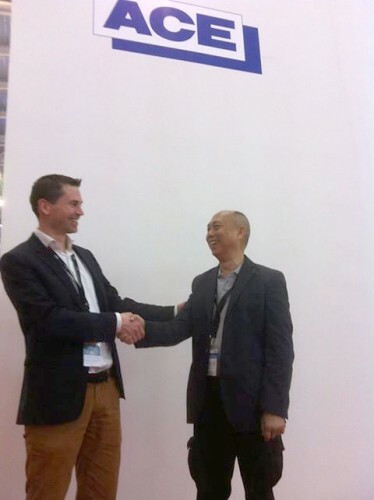 This new partnership began during the Prolight+Sound show in Frankfurt earlier this year, when senior vice president Bingo Tso and business manager Dicky Ling visited the Visual Productions’ stand. Seeing the range of innovative and smart lighting control solutions available from Visual Productions, a product demonstration was arranged for all the ACE team available at the show. Director of Visual Productions, Maarten Engels, talked them through the controllers including the new B-Station and CueluxPro software. In agreement about the market opportunities available with both the Live controllers and the Solid-state range on the Chinese market, both ACE and Visual Productions have not stopped since. As one of the top distributors in China with a preference for professional European designed products, ACE felt that Visual Productions was an ideal candidate to complement the other market leading brands that they distribute. With stock and demo items in place, Engels joined ACE on their stand at the recent PalmExpo in Beijing. It was a busy show with the ACE team dedicated to presenting the products well. Lighting Technician, Kimi Liu, was trained and ready to go with non-stop demos and enthusiastic presentations of all products from CueCore to Cuelux. ACE has four offices within China, including the Hong Kong region. Tso and Ling felt that the Visual Productions range provide perfect solutions for the ever expanding architectural market within China. The products, coupled with good technical support from Visual Productions, will make for a fun and profitable venture in the Chinese market.